This footage comes from the Raw Fruit Festival Spain 2013. 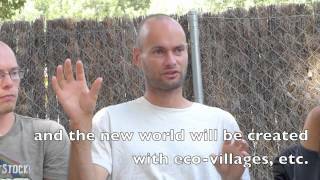 During one of the discussion groups a man named Jerome, who created a vegan eco-village in Southern France, talked about why and how he created his own reality. Many people at the festival share a similar dream of living from the land in a way that is sustainable, secure and free. Eco villages are communities of people living off the land who support each other by working different roles and sharing the land and it’s bounties with each other. Permaculture is a field of agriculture that is focused on self-sustainability. In my opinion, this is the future of life on this planet. We must find a way to go back to nature and end this mass destruction of the planet’s natural resources and the diversity of life. It’s time to end the animal holocaust and stop sucking the earth’s natural resources dry in the name of money and power. Many of the attendees agree that we need to focus on growing our own food, planting fruit trees, and creating ways to establish community that supports these ideas. Jerome was once an activist for animal rights but he realized that the current system is so huge that it is more powerful and effective to create your own world. Thank you for viewing this video. I would appreciate it if you subscribe to this channel and share the link with your friends! Check out my website, http://www.leegaines.com/ for resources and information on living a healthy lifestyle and to learn about my coaching program.